To make these cupcakes, I turned to Martha Stewart's yellow butter cupcake recipe. I made the recipe as is with the addition of gingersnap cookie crumbs to swirl in. Gingersnap cookies have a distinct flavor and I noticed when I made the batter, it also gave off a wonderful eggnog aroma. It really felt like a holiday cupcake even before they hit the oven. 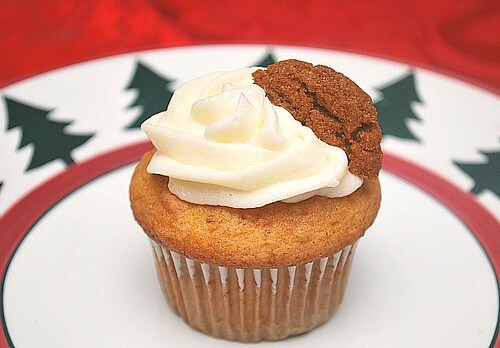 To top these cupcakes, I made a simple cream cheese frosting and garnished with a gingersnap cookie half. *To make gingersnap cookie crumbs, process the cookies in a food processor to crumbs, enough to make 1 1/2 cups for the recipe. Preheat oven to 350 degrees. Line standard muffin tins with paper liners. Whisk dry ingredients in a large bowl. Cream butter and sugar with a mixer until light and fluffy. Add eggs, 1 at a time, beating after each addition. Reduce speed to low. Mix remaining wet ingredients in a bowl. Add dry ingredients to butter mixture in 3 additions, alternating with wet ingredients and ending with dry. Scrape sides of bowl. Divide batter among muffin cups, filling each full. eggnog taste and smell? hmmm so CHristmas-usgue haha!